This vessel was hauled out for a limited scope survey after taking the ground. There were concerns about the keel and supporting hull structure. The cabin sole boards were also lifted in order for access to the moulded floor members inboard. A shapely family cruiser yacht of traditional lines, built by a number of boatyards during the 1950's through to the early 60's. 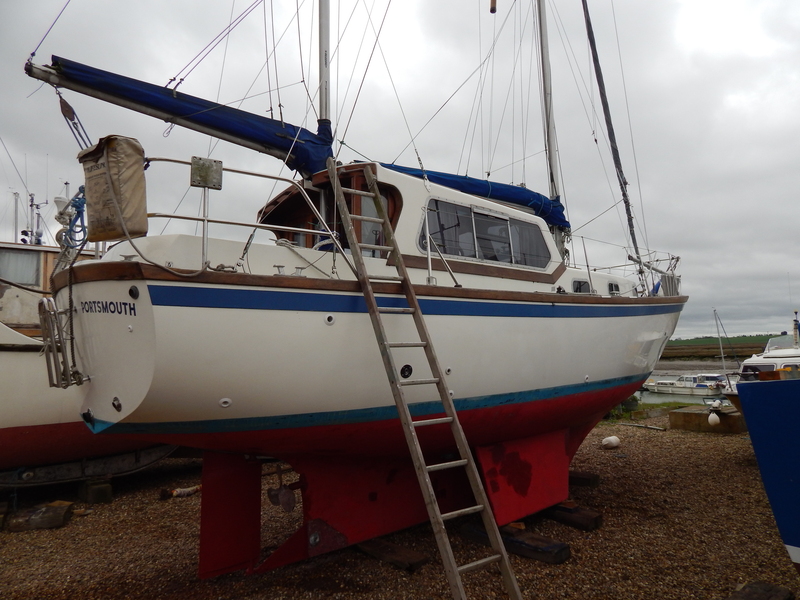 This particular example is a Mk1, where the coachroof line finishes short of the mast position. A 1921 E. L. Woods of Cantley design counter stern yawl. Her lines are believed to have been scaled-up from a smaller yacht by Albert Strange. The hull is of carvel planking over steam bent rock-elm timbers. 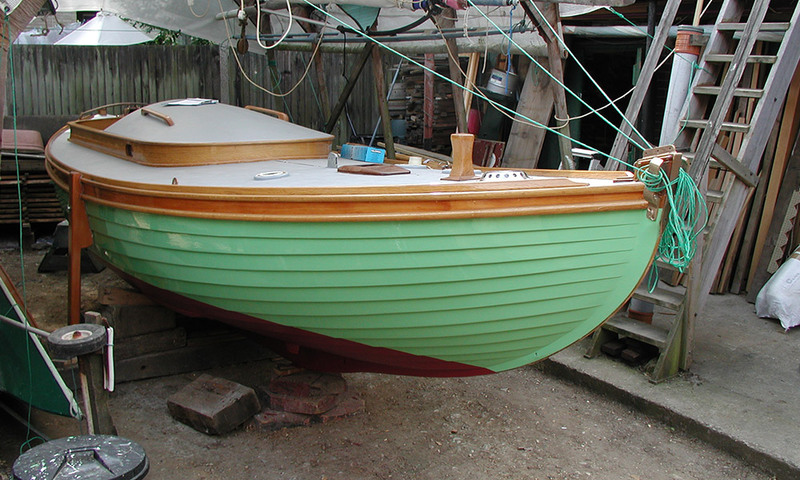 She carries a lead keel with elm fore and aft deadwoods. Her rig was converted to bermudan sloop in 1951; though is now reinstated as originally thought. This picture was taken shortly after a longhaul of restorative works with guidance from Ark Surveys. This unfortunate rudder blade took the near full weight of the yacht after she slipped backwards, partway off the crane slings, whilst on her way to being launched. The blade and shaft were later lowered from the vessel and duly repaired; as good as new. The lines and sail plan of this Albert Strange replica were taken from a 1906 publication of “The Sailing Boat”. For the finer points of deck construction, cockpit and companionway detail, Fabian took advantage of modern methods of marine construction with a very high specification in mind. With these enhancements and with the extensive use of epoxy resin glues used throughout the project, she will, without a doubt, prove to be a very stable composition. 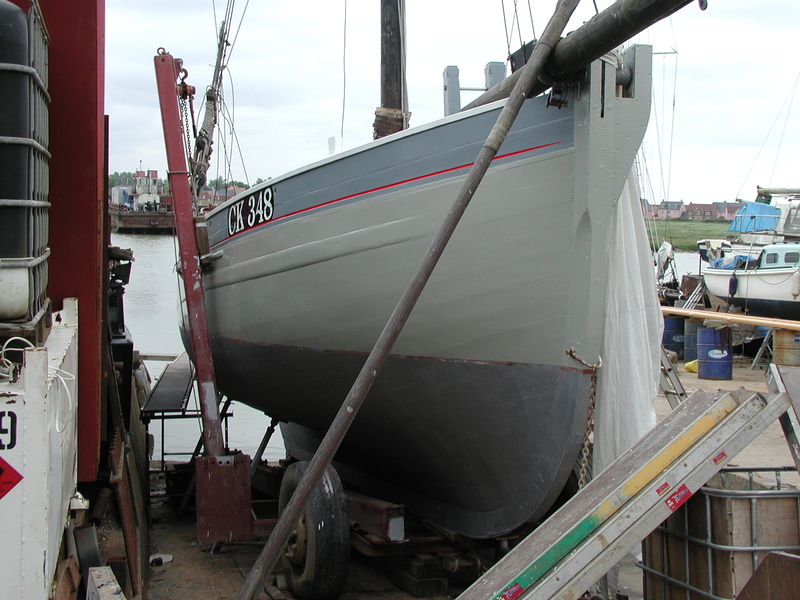 A 1907 east coast sailing smack, hauled out at Downs Road Boatyard for refit and survey. She was rebuilt by local shipwrights at Downs Road Boatyard, starting with a new timber keel laid in 1994, re-launched in 1997 and finally sailing again by 2000. She has that vertical stem (characteristic of east coast smacks), following a long straight keel and finishes with a fine counter stern. 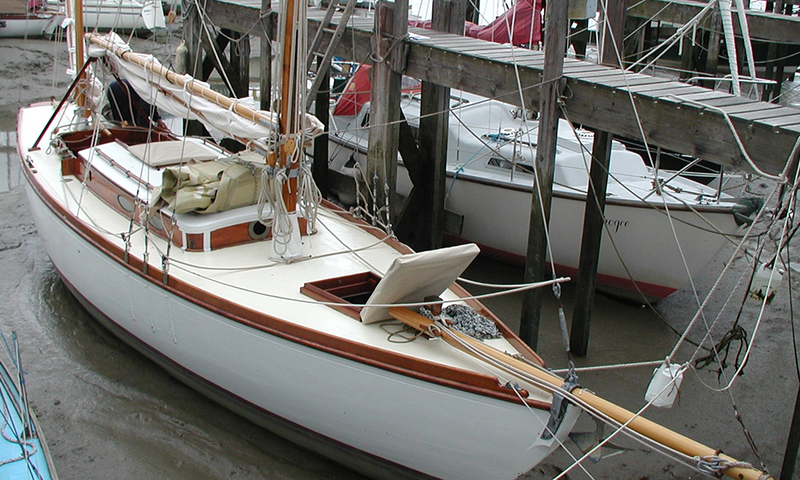 Her sheerline runs a typically low freeboard, with flush decks in keeping with her original form. A small deckhouse and companionway were fitted over her two hold openings. 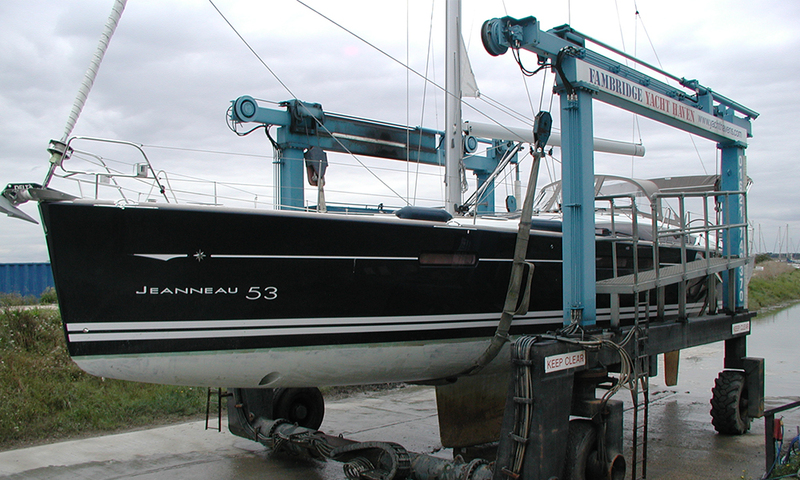 This ketch rigged Colvic Craft Atlanta 32 is undergoing a routine survey inspection for insurance reasons. 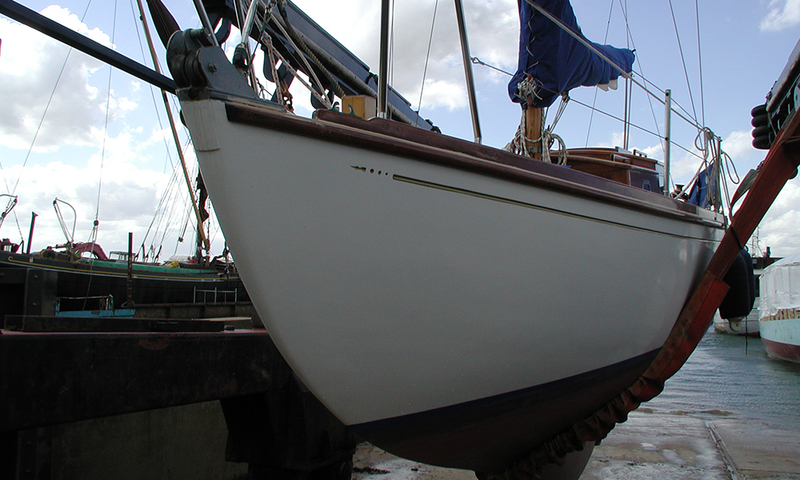 The long keel is integral with the hull moulding and ballasted. The twin bilge keels are hollow section that are later fitted (post moulded hull) as part of the manufacturing process. Decks, cockpit and upperworks are formed in one moulding; fitted with teak cappings and rails. A 26ft gaff yawl, built in around 1912 by Gann and Palmer of Teignmouth. A restoration project that was undertaken solely by the owner, with only limited guidance offered from Ark Surveys nearing completion. 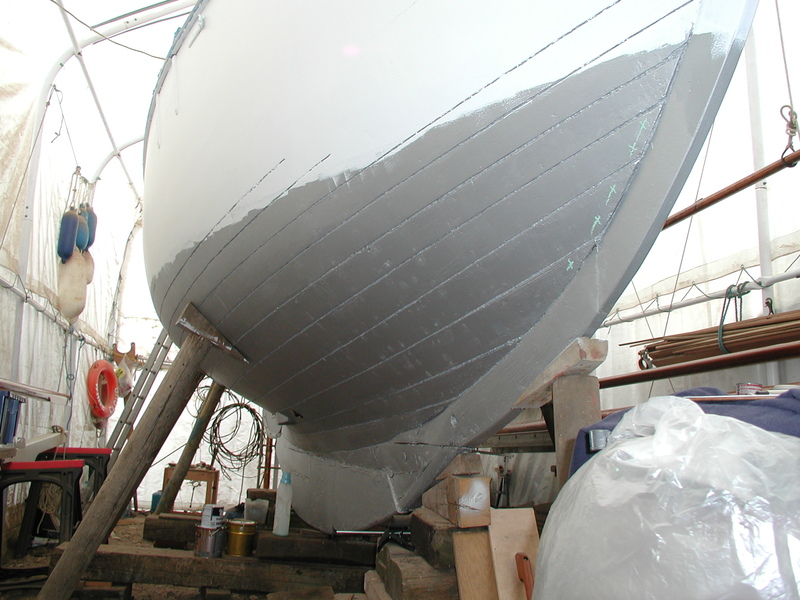 The picture here shows the freshly primer painted hull with newly caulked plank seams. The next task is to double-up on some hood-end fastenings before re-scribing the waterline. Ark Surveys later produced a survey report for insurance cover; prior to re-launching.